Windows 8 launched in the market a few days back. And some long term Windows users might just be waiting to get their hands on the new Windows OS. Some of them who have already used Windows 8 might miss one basic feature of the good old Windows 7. As we all know by now, Windows 8 has replaced the Start Menu with the tile styled Modern UI they call the Start Screen. But many of the users still prefer the old Start Menu. Without it, in order to browse your local files, you would be to use the Explorer. This article tells you how to get the Start Menu back on to your Windows 8 Taskbar. Many startups and other companies have come forward and redesigned the Start Menu for Windows 8. 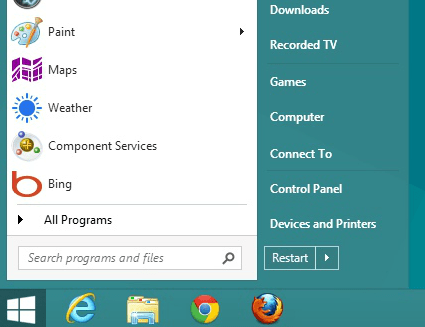 You can get a complete Windows 7 styled Start Menu or a modified and customizable one. Following are few of the many ways to bring back the Start Menu on Windows 8. Some PC vendors are offering free alternatives to the Windows 8 Start Screen. If you purchase a Windows 8 PC, look for the Start Menu replacement tool from your manufacturer. However, since these tools are not officially approved by Microsoft, they will probably not be shipped along with your OS. You will only get it as a free download from the manufacturer’s website. Samsung is currently offering the S Launcher for their recent line of Windows 8 notebooks and PCs which basically replicates the Windows 7 Start Menu on the Windows 8 Desktop. The S Launcher will be available to the Windows 8 users of Samsung as a free download, as an alternative to the Windows 8 Start Screen. So if you own a Samsung laptop and planning to upgrade to Windows8, you need not worry about losing the Windows 8 Start Menu. Lenovo is another company which is likely to offer a Start Menu replacement for its customers, and we are probably going to see more of these Start Menu replacements coming from the various hardware partners of Microsoft. Get in touch with your manufacturer and try to find out if they provide such a replacement or not. A startup named Pokki has done a good job in recreating the Windows 8 Start Menu. It adds a social taste to the conventional Start Menu of Windows 7. It provides a lot more additional features including a universal search bar, links to your favorite apps and sites, all your programs and additional apps from the Pokki App Store. Pokki also lets you skip the Windows 8 Start Screen after the system boots up. Additionally, it can disable the “hot corners” on the desktop (which used to bring up the Start Screen or the Charms UI). Additionally, the Pokki Start Menu has a live notification system which integrates with your social accounts like Facebook, Twitter, GMail, etc. Start Menu for Windows 8 can be downloaded free from the Pokki Website and can be installed on any Windows 8 computer. If you want a more polished and more customizable version of the Start Menu on Windows 8 at the cost of a few bucks, Start 8 from Stardock is an excellent option. Start 8 integrates with the Modern UI and gives you full control of the behavior of the Start Menu. The Start Menu can be customized to have the usual items within the Windows 8 Theme, or you can opt for a more Classic Windows 7 like Appearance. It can also be set to hold the entire Start Screen inside the menu. Additionally, it also has a link to the Start Screen on top, so users can easily switch between the Start Screen and the Start Menu. Like Pokki, it also has options to skip the Start Screen after boot up and suppresses the hot corners in the desktop mode. Hot corners are enabled when the user operates the Modern UI. Start8 is smooth and slick and works very well with Windows 8. It can be purchased from the Stardock website for $4.99 only.